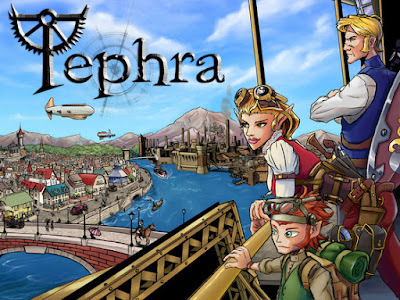 TEPHRA, The Steampunk RPG recently posted on KICKSTARTER! What could this mean to you? What rewards are there for the donation levels? Our Gratitude - you'll be listed on our website as one of our donors. A Thank You Card - we'll send you a thank you card as well as a little random goody (such as an adversary, news article, or lore character). We'll also list you on our website as one of our donors. Tephra: Core Rulebook - you'll receive one of the first copies of the Tephra Core Rulebook and be listed as a donor on our website. Tephra and a Dicebag - you'll get one of the first copies of the Tephra Core Rulebook and a hand-made dicebag (by our staff) with a few of our D12s inside. Of course, you'll also be listed as one of our donors on our website! Tephra, a Dicebag, and some Adversaries - you'll get the Tephra Core Rulebook, a hand-made dicebag with some of our D12s, and a packet filled with adversaries that we've made specifically for our kickstarter backers! Need I say that you'll be listed on our website? Tephra, Tephra, Tephra, Dicebag, and some Adversaries - not only are you getting the Tephra Core Rulebook, you're getting THREE of them (your players need them too!). You'll also be getting a large hand-made dicebag, several D12s, our adversaries packet, and noted on our website. Become an Adversary! - Look at the $100 Reward. Not only are you getting everything there, you'll also be able to describe yourself to one of our game developers, and we will MAKE YOU (or your alternate personality) into one of the adversaries to be included in the special edition kickstarter adversary booklet. Narrator's Set - You'll be getting five Tephra Core Rulebooks (one for yourself and one for each of your players). We'll include the limited edition adversary packet, a large dicebag full of D12s, character sheets, pre-made characters, and some previews of our upcoming expansions. And who knows, we might even list you as a donor on our website! See the Narrator's Set for the $250 pledge? Not only are we going to give you that, we're going to hand deliver it, show you how to play, and run a game for you and a group of your choice. Tonight and Tomorrow in Austin, TX!